If you are short of time, the answers to the following 3 questions should let you know all you need to about the Sonicare 3 Series. If we have missed something, let us know in the comments. If you want more detail, you can read our full Sonicare 3 Series review further down the page or watch our video review. Sonicare know how to make a great electric toothbrush and the 3 Series is a great example of what is possible. Newer models represent better value. The 3 Series is a great brush, when picked up at the right price. We’d also recommend considering our recommendation for best overall electric toothbrush. 3. Where is the best place to buy the Sonicare 3 Series? CVS Pharmacy, Walmart, Amazon, Best Buy, Philips Online store and many more, you can pick this brush up from many leading retailers who stock oral healthcare products. Our recommendation is to buy from Amazon as more often than not their price is the best out there and their service is excellent too. However, buy from a store you are happy shopping with and pay a price you are comfortable with. 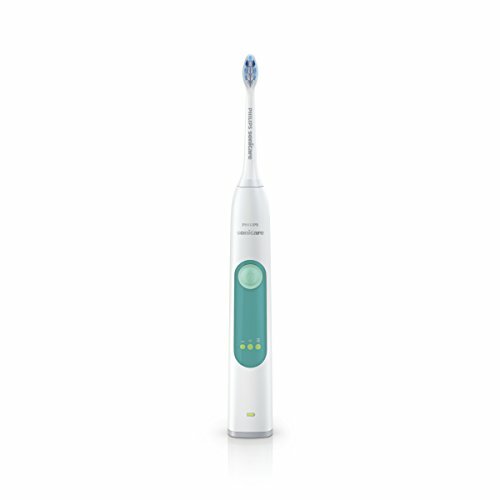 The Series 3 electric toothbrush from Sonicare builds on the 1 and 2 Series that come before it, addresses some potential shortcomings whilst adding some extra value to the package. A great brush it is,more than capable of meeting the expectations most of us have of an electric toothbrush, but it starts to verge into a dangerous territory of more premium brushes that offer more and in turn have a higher ticket price. What are the benefits and drawbacks of the HX6631 Gum Health toothbrush? Clean – It offers up a really good clean that can deliver up to 6x more effective plaque removal and this is made more enjoyable with the adjustable pressure settings. Battery life – With up to 3 weeks battery life it sets the bar high and exceeds almost all other brushes available today. Travel case – Protect the brush heads and handle when on the move. Unconventional the design of the Series 3 is not. It has a very typical, clinical look to it. A cylindrical shaped brush handle with detachable brush head. Sadly you do not get the nice variety of colour options that are available with the 2 Series. It is far from a big issue, the White and Persian Green colour combination here is not exactly offensive, but it is not the most appealing for the design and fashion conscious. The prominent colour is White as you might expect, with the Green being the colour of an inset within the front of the brush. Located pretty much halfway down the front of the brush handle, inside this is the power button which is more of a Mint Green and then 3 LED’s that relate to the brushing intensity. Above the panel is the Philips Sonicare logo in a grey text and below it, the battery indicator bar. The indicator lights up different colours based on the condition. More about this and the 3 week battery life, in the battery section of this review. The smooth touch White plastic offers a certain level of grip, but the back of the handle does have a series of raised dots to which the fingers naturally fall, offering a good resistance to allow the brush to be gripped, even when wet. Oral-B’s brushes might sacrifice the battery, but the likes of the Pro 3000 are a bit slimmer in hands and the rubber grip in my mind is nice to the touch. On the bottom of the brush handle is a Grey base plate which accents the White body slightly. In the centre is a small recess into which the charging prong found on the charging stand fits. The brush will stand upright when not on the stand. At the top of the brush handle is the metal shaft that is connected to the motor inside the brush handle. It is to this that the interchangeable brush heads clip onto. Provided in the box is the ProResults Gum Health brush head. One of a range of different brush head styles on offer from Sonicare, you can pick these up in varying pack sizes as well as choosing between standard or compact sized heads. Compact heads can be particularly useful for Children or reaching the very back of the mouth if you are restricted for space. All the heads offer different benefits, but all provide a better clean normally than a manual brush. Studies have found you can remove up to 6x more plaque at the gumline than a manual brush, which is a significant improvement. You should replace the brush head every 3 months, for the sake of your teeth and oral health. If you notice that the bristles have frayed or split then you should do it sooner. It is easy to forget when you changed the brush head last, so to help, the heads themselves have something called indicator bristles. Blue in colour over approximately 3 months the bristles fade to a pale Blue almost White colour. Take a look at these and if they are pale it is likely time to replace that head. With the brush head fitted, press the single power button to turn the brush on. The button itself has a resistance and its not easily activated, but its not too stiff that the young or old will struggle to use it. The brush begins in the one and only mode available, ‘Clean’. An extra touch on the 3 Series compared to the 2 Series is the addition of intensities. You can chose from Low, Medium or High. As you might expect the higher the intensity the more movements per minute the brush head makes. The Sonicare 3 Series delivery up to 31,000 movements per minute at full power. If you have sensitive or sore teeth and gums you might find reducing the intensity will be more enjoyable to you. It is not essential to use it on full power because the brush will still help you clean more effectively. However, you should if you can to operate on full power. The beauty here is that you have the choice. Within the Green panel on the front of the brush are 3 LED’s, 1 for each intensity. Power the brush on and then press the button again to change the intensity. The LED’s will change accordingly. Keep pressing to change the intensity to that you desire. Press and hold to turn the brush off. The different intensity settings in some respects is like having a different cleaning mode. Some Oral-B models for example offer a gum health or sensitive mode. These are modes that are less powerful than the standard daily clean mode. A similar effect is achieved here. So, taking the Pro 3000 for example, you could argue that 3 Series offers equivalent, albeit the different intensities are not advertised as cleaning modes. If you were not already impressed by this feature another innovative touch is Sonicare Easy-start mode. As electric toothbrushes are more powerful than manual brushes they can take some getting used to. Sonicare helps with that. Essentially, for the first 14 cleans, the speed of the brush motor gradually increases until it reaches full power. This means that in the first few uses where you are not used to the power, you are actually enjoying less movements per minute to ease you in. The clean offered by the brush is very good, you will notice the difference and I suspect your dentist will too. A pressure sensor is tool that can help alert you if you are brushing too hard and help avoid this happening. Sadly the Sonicare 3 Series does not have this. The handle itself is water-resistant and can withstand toothpaste, saliva etc. It can be rinsed under the tap, get wet in the shower but do avoid submerging the handle. It is also quieter than Oral-B equivalents. They tend to have a more mechanical sound when running, whilst the 3 Series produces a strong humming sound and vibration in hand. What I like about the Sonicare is that it the better brand to use if you often have to clean your teeth when others are asleep in your home. In hand the brush feels solid and is testament to the quality you would expect of a Sonicare brush. Peace of mind is achieved via a 2 year warranty that can be extended by a further 6 months at no extra cost if you desire, by registering it online. A last and final extra to talk about here is the included travel case. White in colour it is a solid plastic shell that has a clip that keeps it closed. Inside is a space for the brush handle and up to 2 brush heads. It is fairly robust and will certainly protect the handle and heads when travelling. It is of a better quality than most of the competition at this price. Practical, it will stop any embarrassing activations of the brush when in the bag and it has vents to allow the heads to dry and breath. You cannot charge the brush in the case like you can with the Sonicare DiamondClean family. For many of us, the type of battery within the brush handle does not matter all that much as long as it does the job to the standard we expect. For years, few really questioned it, because manufacturers did not use the technology as a selling point. However, more recently there has been more focus on promoting the use of Lithium-Ion batteries within models. Li-ion is the newer and better alternative to Nickel Metal Hydride (NiMH) batteries that have and still are used in many brushes. Technically Li-ion are more reliable and do not degrade as quickly. As a result, the Essence and 2 Series that come before this 3 Series model are at somewhat of a disadvantage. This 3 Series has the sought after lithium battery and the resulting battery life is an impressive 3 weeks or more.. Particularly good this is, because the brush handle is no bigger than the model before it. Having a lithium battery is a bonus, but it should not really be the deciding factor. My personal view is that a battery within a brush should last at least a week, preferably 2 or more. The 3 Series here wins points for lasting so long. My own hands on testing, with the intensity set to high, a fully charged brush managed to achieve 108 minutes of usage time. That equates to 27 days based on 1 user cleaning their teeth twice a day for 2 minutes. That is a further 6 days over and above the suggested battery life. So it is safe to say 3 weeks is achievable. When the brush does require charging, you can connect the charging stand, that is provided in the box to the socket and leave it to be recharged. It can take up to 48 hours to charge the brush handle fully, but you can use it sooner. The handle sits upright on the charging stand, with the prong on the top, fitting nicely into the recess on the base of the brush handle. The battery indicator on the brush handle lights up different colours to give different feedback on the condition/status of the battery. Flash green the battery indicator will whilst it is on charge. When not on the charger if there is a yellow battery level indicator on the brush handle, this means there is a low charge. A green light indicates a high charge. The battery indicator turns off when the battery is between a high and low charge. When you hear 3 beeps and the battery indicator flashes yellow, this means the battery level is at 10% and should be recharged. 2 sets of 5 beeps will mean the power is too low and needs to be charged before it can be used. Manufacturers can suggest a price at which the brush should be sold at. Retailers then have the choice at which they do actually sell it. However, these have to align what you feel the brush is really worth. The suggested selling price is $89.99 (we have included a live price comparison here) and this is not excessive for the feature set and performance of this brush. I would say from my experience this is about right. Reality is though, there are often savings to be had and with little effort you can purchase this for around the $60 price point. You see, it is quite typical for electric toothbrushes to be discounted. At $60 it becomes an even more attractive proposition. It is roughly $20 more than the Series 2 brush that comes before it and or that you get a travel case in the box, better battery technology and the ability to change the power of the brush to one of three intensities. But, with adding this to the price it brings the brush within the territory of some of the Oral-B models, which are more expensive, but maybe justifiably so. The Pro 3000 from Oral-B for example offers for about $20 more, 3 cleaning modes as opposed to Sonicares 1. It has a pressure sensor, Bluetooth connectivity and brush head storage compartment as well as being thinner in hand. It does sacrifice battery life and the travel case though. Spend another $30-40 and you can buy the Oral-B Pro 5000. The battery life is half that of the Sonicare, but 5 cleaning modes, pressure sensor, Bluetooth, travel case and brush head storage compartment are compelling reasons to consider it. This decision is personal and I would not suggest easy. What the Sonicare has is a focus on 1 cleaning mode and is not burdened with what some might consider unnecessary features. Using the $60 cost for the brush handle and factoring in $88 for replacement brush heads, the Sonicare 3 Series costs $148 over 3 years or $0.14 cents per day to own. This is up 2 cents per day on the Series 2. One thing not helping the Sonicare long term is the higher average cost of brush heads. Oral-B’s tend to work out at $5 per head. Therefore compared this to the Pro 3000 from Oral-B and that comes in at around $135 or $0.12 per day. The Pro 5000 is $155 or $0.14 per day. An electric toothbrush has a typical working life of 3-5 years, hence we work the price out based on 3 years. You can then see how the initially more expensive brush over a 3 year period is actually the same price or cheaper. Sonicare are manufactured by one of the biggest brands worldwide. Philips tends to fall into most users ‘premium’ brands list. As a result on the whole you can be assured of a high level of quality, craftsmanship and reliability. To date we would side with this, as Sonicare models tend to be the more reliable of the brands we have been exposed to. Of course, being an electrical product things can go wrong, but then again that is what the warranty is for no? A 2 year/24 month warranty is provided as standard with the brush, but go online, enter a few details and within a couple of minutes you can extend that by a further 6 months for free. Here at Electric Teeth we go hands on with the brushes and look for possible defects and weaknesses. We are not scientists, product designers or have expensive testing equipment to hand. Regular individuals like you, we just have the added experience of having handled hundreds of different toothbrushes to come to the conclusions we do. The 3 Series poses no cause for concern and expect you to have many years of happy brushing from this. Great, excellent, superb, spot on and terrific are all words I can use to describe this toothbrush. It has the basic electric toothbrush needs covered and then some. Clean teeth and a fresh healthy mouth are a guaranteed result of regular use of this brush and the adjustable power settings makes it more enjoyable for users of all ages and preferences. The battery life is stellar and the inclusion of the travel case is a welcome addition. However, this comes at a price and herein lies a challenge. What is it really worth? In truth few really offer so much for the price you can pay, but the new Sonicare ProtectiveClean 4100 is a better value purchase all things considered. The HX6610-01 # is the internal manufacturing part number. Is the Sonicare 3 Series an oscillating brush? What cleaning modes does the 3 Series have? The Sonicare 3 Series comes with a ProResults Gum Health brush head. 1 is supplied in the box. There are a variety of other head styles you can chose from including DiamondClean, InterCare and ProResults Plaque Control. Many of which come in either a standard or compact size. Does the 3 Series have a pressure sensor? Does the 3 Series have Bluetooth? Does the Sonicare 3 Series come with a warranty & how long is it? If purchased new from an approved retailer the 3 series will come with a 2 year warranty which can be extended by a further 6 months in total if you register the brush online at Sonicares website. Does the 3 Series have a built in timer? The battery lasts up to 84 minutes, which if used on the standard clean mode, this is 21 days based on 2 cleans per day. Yes, a charging station is included with the Sonicare 3 Series. Can I use the 3 Series in the shower? Yes. The brush is water resistant so if you choose you can use it in the shower. Do you own or have you used the Philips Sonicare 3 Series?